Tonight A 40 percent chance of rain, mainly after 10pm. Mostly cloudy, with a low around 50. East wind 5 to 8 mph. New precipitation amounts between a tenth and quarter of an inch possible. Friday Rain, with thunderstorms also possible after 10am. High near 58. Southeast wind 11 to 17 mph, with gusts as high as 23 mph. Chance of precipitation is 90%. New rainfall amounts between a half and three quarters of an inch possible. Friday Night Showers. Low around 49. Southeast wind around 15 mph, with gusts as high as 20 mph. Chance of precipitation is 80%. New precipitation amounts between a tenth and quarter of an inch possible. Saturday A 40 percent chance of showers. Mostly cloudy, with a high near 62. Southeast wind 11 to 14 mph, with gusts as high as 18 mph. Saturday Night A 20 percent chance of showers. Partly cloudy, with a low around 46. As if the combination of rain, wind, wet soil and suffering, tall, trees near the house isn't enough to have homeowners glancing warily at their roofs, there's more. To complicate matters, spring is getting an early start here. Fruit and nut trees are in full blossom, increasing the 2014 chances of diseases (hello, peach leaf curl!). For those of you reading this outside of California...yes, we are weather weenies. A half inch of rain causes all sorts of havoc here, including clouding drivers' minds with the thought: "If I drive faster, I can beat the rain." TV newscasts immediately bring the "Action News Storm Desk Central" set out of storage, and sends the writers into a panic, coming up with the next 80-point graphic: "Rainageddon!" "March Monsoon!" 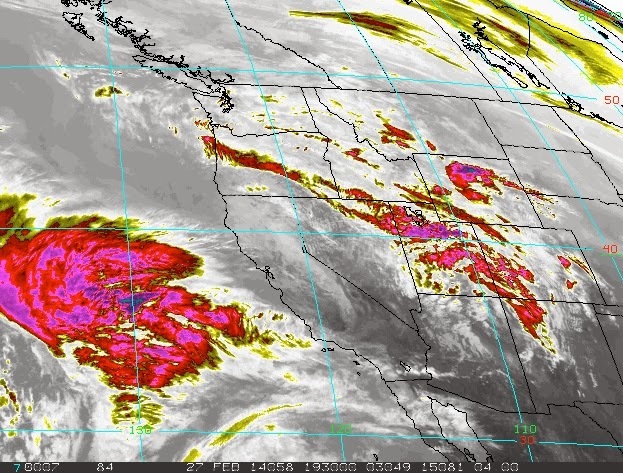 "California Cloudburst!" 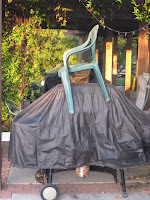 • Secure, cover or remove patio furniture, bbq. • Remove pads and umbrellas. • Add compost to garden bed. Let the rains move it downward. • Move plant starts to a safe area. • To fertilize or not fertilize the lawn before a predicted rainstorm? Pros: fertilizer will be worked into the soil effortlessly. Cons: heavy rain could wash fertilizer off a lawn, especially if it is sloped, into the gutter. Synthetic chemicals in lawn fertilizers can damage creek life. Using organic fertilizer is one possible solution. Still, runoff from that can cause problems, as well. Do you feel lucky? • Remove diseased, dying plants and fallen fruit (Admit it. You haven't cleaned up under your fruit trees. Yet.) Rainfall can spread harmful fungal diseases. • Low spots? Mark those overly wet areas with a stick and take action after the storm (see below for more). • Turn off the automatic sprinklers. Just water manually, as needed. And trust me, "as needed" is a lot less than you think. 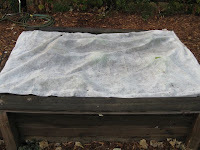 • Protect new plants in the ground with row covers. Heavy rain could uproot seedlings. Row covers will disperse that action. • Move tools indoors. Cover or move lawn mowers, tillers, etc. • Turn over buckets, pots, etc. to keep mosquitoes from breeding. • Do you use a sump pump during the winter to move water from unwanted areas, such as pool covers? Make sure it is working! • Wind and rain means downed tree limbs onto power lines. How's that generator working? • Do you have a covered area to feed outdoor pets? • Do you have a shelter for your outdoor pets? • Empty pool filters. Storm-driven leaves are on the way! 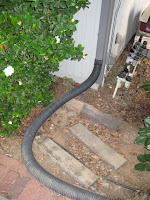 • Cover the pool and spa to keep debris out. • Secure the spa cover. They will blow open! 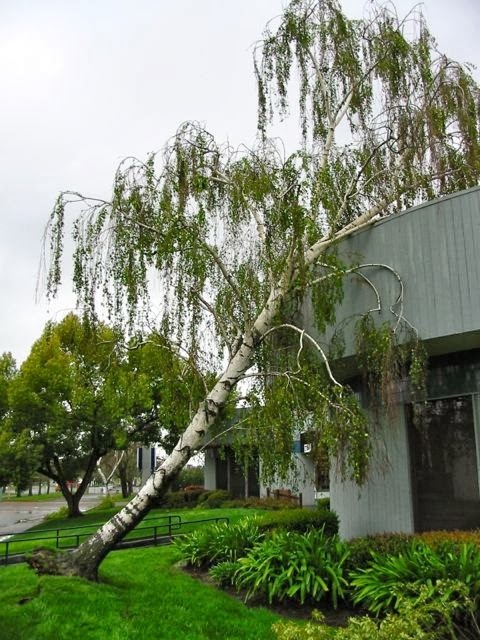 • The combination of evergreen or leaf-heavy trees and storms means a high possibility of large branches falling. Move your valuables out of harm's way, including your vehicles. 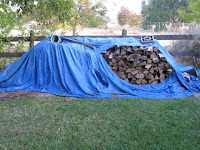 • Replace torn tarps on firewood. • Clean roof gutters before the storm. • Dig a sump. A hole that is dug in the lowest portion of your yard, a hole that penetrates through all the layers of hardpan (usually 2-4 feet below the surface), can help drain away stormwater. Line the hole with a non-porous material (hard plastic sheeting, for example) to keep the surrounding dirt from falling back into the hole. Fill the hole with small rocks, about one inch in diameter. • If it's the lawn area that's flooding, dig a trench and lay a drain line in the lowest area of the lawn. Don't do any digging immediately after a heavy rain, though; wait until the soil dries enough to avoid unnecessary soil compaction. • If you're still stuck with pools of standing water after heavy rains despite your best efforts, consider planting trees and shrubs that can take "wet feet". Water-tolerant trees for our area include birch, sweet gum, magnolia, tupelo and coast redwoods. 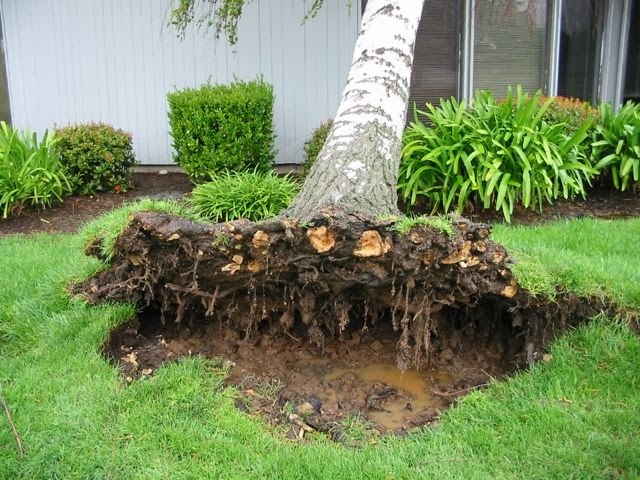 Remember, though, that even moisture-tolerant trees cannot survive anaerobic soil conditions for long. Make sure that you are not overwatering, and that there is drainage. Shrubs for wet areas include thuja and red twig dogwood. But before you plant those, remember: we are still in a drought.